The Bird Box challenge continues to cause more problems. Police in Utah have issued a warning after a teenage driver took part in the challenge inspired by the hit Netflix movie and crashed her car into another vehicle while blind-folded. In the movie, Sandra Bullock’s character, along with the rest of the cast, must keep their blindfolds on to avoid looking at a mysterious force that causes people to commit suicide. The Bird Box challenge has already sparked controversy, which ended with Netflix sending out a warning of their own. 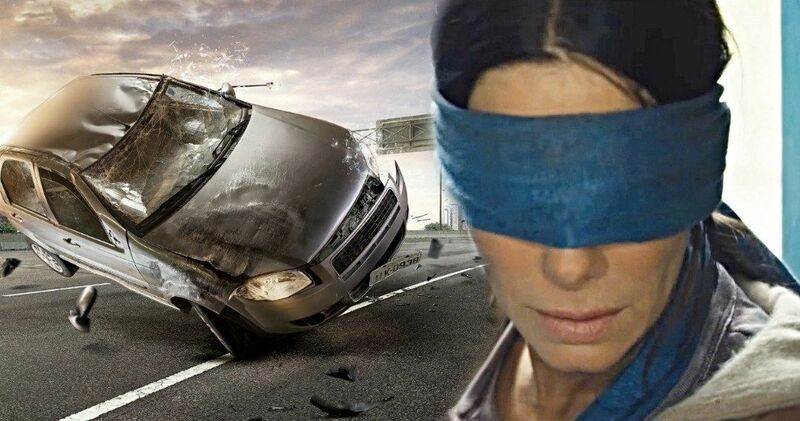 Utah police have not identified the 17-year old who took part in the Bird Box challenge while driving on Layton Parkway. She reportedly put her beanie on over her eyes, which caused her to lose control of her vehicle. According to police Lieutenant Travis Lyman, she then “skidded into the westbound lanes of Layton Parkway and hit another car and ended up hitting a light pole as well.” There was a 16-year old passenger in the car, and thankfully nobody was seriously injured. Layton police posted a picture of the Bird Box challenge aftermath and all parties involved are extremely lucky that there were no injuries. Both cars have some substantial damage. After the police posted the picture on social media, many began to chime in and talk about how dumb and dangerous the stunt was, with more than a few suggesting that the teenager be charged with attempted vehicular homicide or criminal negligence. There is no word on whether or not the driver’s insurance will cover her after finding out the details that led to the crash. At the beginning of the month, Netflix issued their own warning on social media after the Bird Box challenge started to go viral. Fans of the hit movie were, and apparently still are, blindfolding themselves and walking into walls and doors along with walking into traffic. The streaming platform does not endorse the challenges and says that they do not want people in the hospital due to making memes. A quick search on social media proves that the Bird Box challenge is still alive and well, which is both good and bad for Netflix. All of the word of mouth marketing has been great for Bird Box and Netflix. The first week saw the movie hit 45 million streams, which makes it the most-watched piece of original content that the streaming platform has released thus far. On the other hand, there are still people attempting the Bird Box challenge, with some trying it for a full 24 hours. It appears that the challenge is 2019’s answer to last year’s dangerous Tide Pod challenge, which is pretty scary. Whatever the case may be, Utah police and Netflix are asking people to be extremely careful when they attempt the Bird Box challenge. You can check out the result of the blind-folded driver’s challenge below, thanks to the Layton Police Twitter account.